A bike ride to Fremantle today. 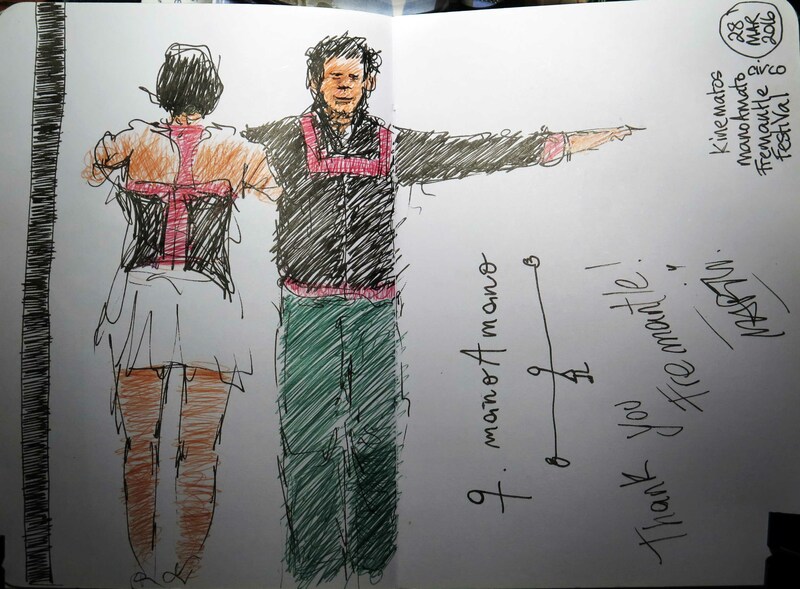 This is a super quick sketch of a duo called “ManoAmano- circo” from Argentina performing their act called “Kinematos” on the Esplanade as part of the Fremantle Festival this Easter weekend. (Freo was very busy on Easter Monday ….don’t think I’ve ever seen so many people there). They were really good with the act centered around a pole tethered to the ground….part clown, part death defying acrobatics. 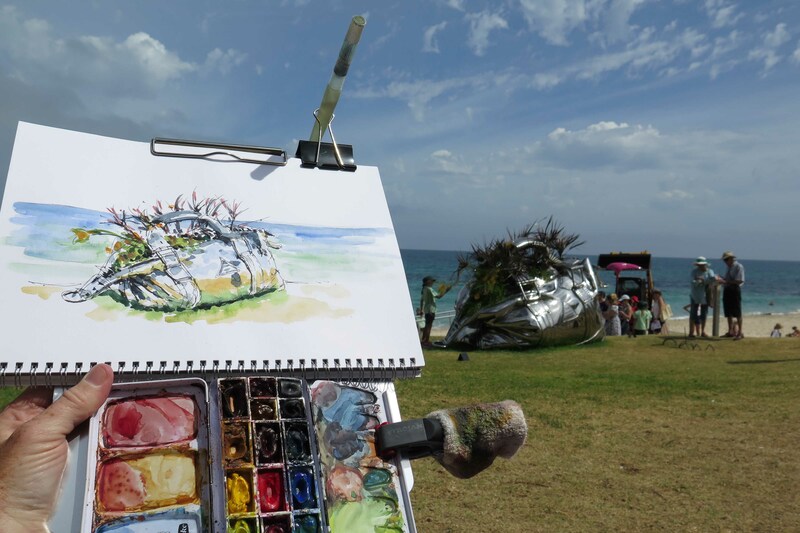 My sketch is really, really rough (fountain pen and multi-coloured ball point pen)…there were lots of people watching so it was hard to get a good vantage point and the pair (Ana and Martin) moved around a lot…. so to isolate one part of the act was tricky for me…. to draw so quickly…. At the end I asked if they would sign the sketch… which you can see on the right….a lovely afternoon….now to cycle home again…. 5 Day Sketch Challenge….catch – up day 4 & 5 !!!! A couple of catch-up pictures for days 4 and 5 of the sketch challenge, both on the same paper but with different media and photographed under different lighting…..makes for different feeling to the sketches. 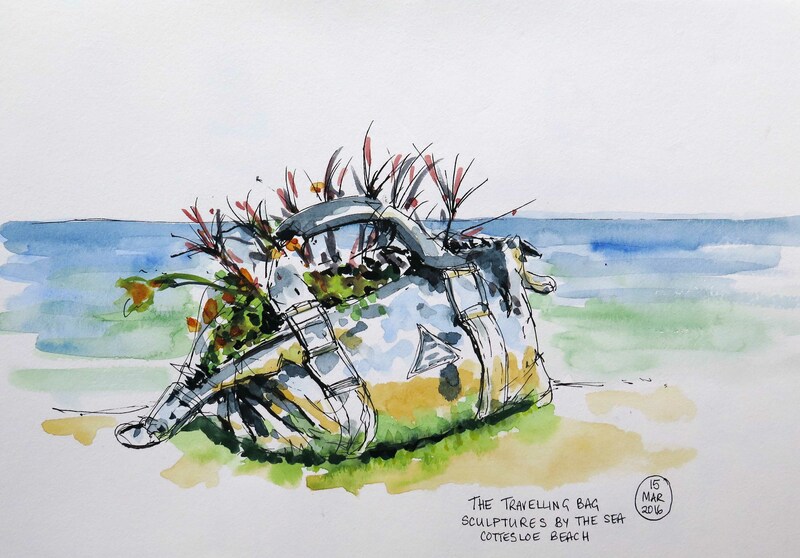 The city beach sketch is done with fountain pen and watercolour paints on location and photographed in natural light. The “judo” sketch is drawn with fountain pen but coloured with Prismacolor coloured pencils and more importantly photographed late at night under artificial light…..the “white” of the paper seems more brown…..creates a completely feel to the sketch. Student hard at work on their computer in the library yesterday. Pilot Parallel Pen 1.5mm, De Atramentis document black ink, Holcroft A6 notebook, Uniball gel pen, Polychromos coloured pencils. 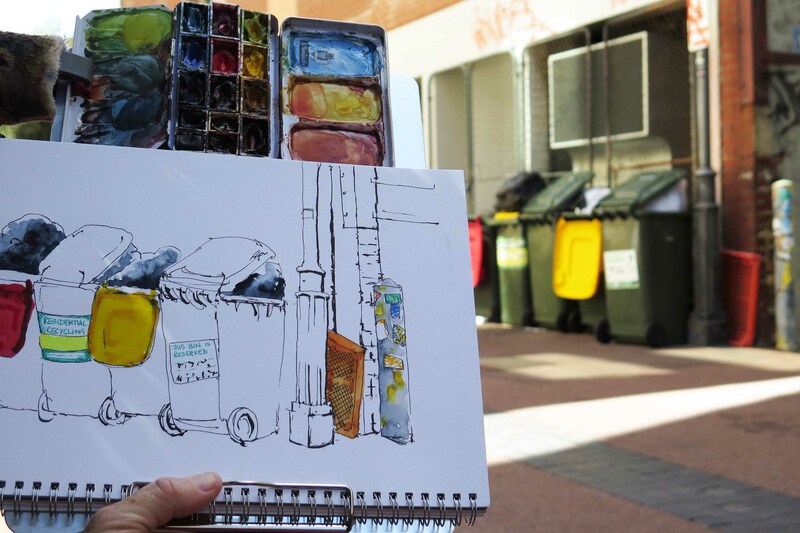 Different views of Wolf Lane (off King Street in central Perth) this morning with the Perth Sketchers. Two very different takes on the lane-way which has been revamped by the city with cafes and lots of really interesting large scale murals/graffiti. The the picture on the left was sketched first and took about an hour, I wasn’t too happy with the end result….it’s a bit overworked and lacks a focal point. I think it would’ve been better to focus more on the two chairs and push the lane-way into the back ground. 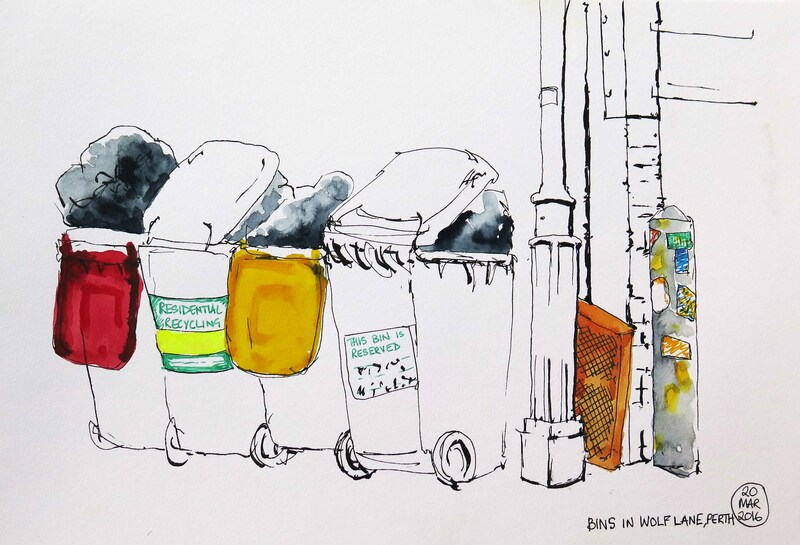 The second sketch is the row of bins all filled up with overflowing bags after a big weekend….this one only took 20 minutes (1/3 the time of the first sketch) and is much fresher and more spontaneous. The old adage that “less is more” seems to work in this case….some times the most mundane items can be the most interesting. I’ve had a request to meet the 5 day sketch challenge from fellow local sketcher Evelyn Bach….the idea is to post a sketch a day for 5 days (sketches don’t have to be recent…..just have to post every day on facebook). Given that I’m pretty busy right now I’m not sure I can do every day but I’ll start here with day one and see how I go….. These sketches (apart from the upper left) are drawn this evening from the TV…. watching a doco (Aussie slang for documentary) called “Rain in a dry land” about a Somali family of refugees who are relocated to the US and the struggles they face in adapting to the language and cultural changes of a new and different country. 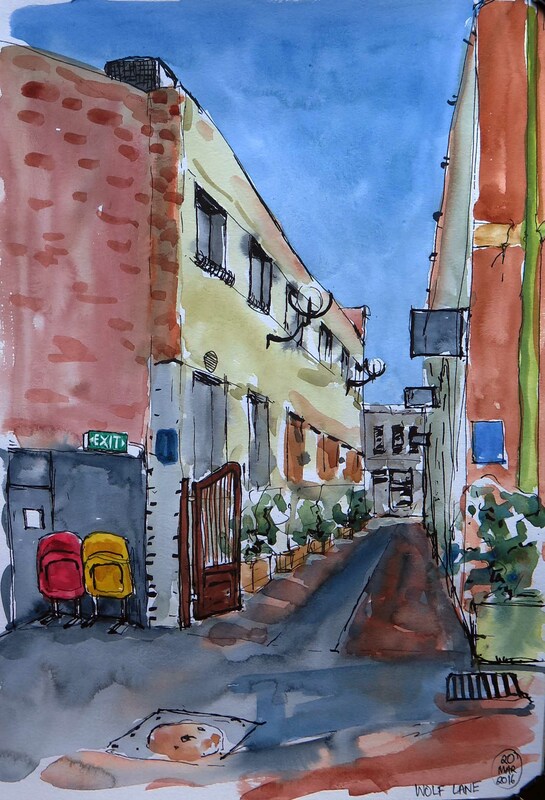 I just pressed the “freeze” button on the control for 5-10 minutes to quite quick sketches with water-soluble ink in a Lamy fountain pen then washed over some water colour paint….Perelene Maroon, Burnt Sienna, Cobalt Blue and Ultramarine Blue (plus a little Hansa Yellow medium in one picture).